Choose from 9 hotels and guest houses in Northamptonshire. Shown below a just a selection of the hotels available. To search within an area please use the menu on the right. The charming appearance of the hotel's Georgian frontage and the mews courtyard at the rear are matched by the immaculate bedrooms, fine restaurant and cosy bar. The Lime Trees Hotel offers comfortable, high-quality accommodation in a great central location, just half a mile (0.8 km) from the very heart of Northampton city centre. The hotel offers free parking in the secure courtyard car park and the M1 is within easy reach, making the hotel a good base for exploring the many surrounding attractions. All bedrooms are decorated and furnished to a high standard, and each room is well equipped with all the modern comforts and facilities you need in a peaceful, relaxing base. An ongoing refurbishment of the rooms has been taking place since 2005 and many have now been elevated to a very respectable 3-star superior finish. Please note that this hotel is completely non-smoking. Whittlebury Hall is set in rural Northamptonshire and offers 4 restaurants, a leisure club, a day spa and a management training centre. 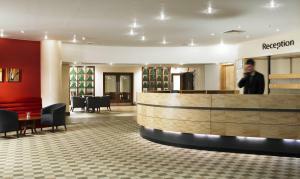 Whittlebury Hall has 4 restaurants, one of which holds 2 AA Rosettes for gourmet excellence. The spa at Whittlebury Hall is one of the largest in the country, with 23 treatments rooms and some of the latest 'heat and ice' facilities. There is also a 19-metre pool, whirlpool spa, bubble jet, steam room, sauna, aerobic studio and a 42-station Cybex gym. Easily accessible from the M1, M6, M40, and Birmingham Airport, the hotel is one of the Midlands' top locations and presents itself as the ideal venue for training and conferences. Set in its beautiful Daventry backdrop, Staverton Park makes a lasting impression while providing a comfortable and inspiring surrounding for your business and leisure stays. Offering a relaxing atmosphere, this purpose-built accommodation offers a wide choice of rooms set within stunning grounds. Facilities include an indoor leisure complex with pool, sauna, steam room and whirlpool spa and PGA standard 18-hole golf course. As one of the UK's leading specialists, the hotel can offer everything you require for a successful business stay of training, leadership and development courses and more, within a unique and dedicated environment. 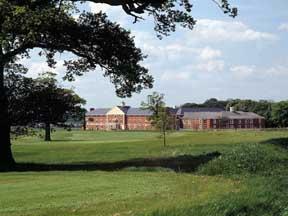 Amid 165 acres of beautiful parkland, this unique resort offers discounted green fees, free parking and free use of a spa, gym, swimming pool, sauna, steam room and tennis courts. On the outskirts of Northampton, the Overstone Park Hotel, Golf & Leisure Resort has a beautiful 18-hole golf course and a luxury Health Club with impressive facilities. Just minutes from the M1 (junction 15) or the A1/A14 links, the resort is ideal for local sites such as Moulton Park, Round Spinney, Brackmills and Grange Park. Major tourist attractions such as Silverstone (Grand Prix weekend in June), Billing Aquadrome, Santa Pod and Rockingham Speedway are within easy reach. Ideally located for business events in the East Midlands, this modern hotel in Northampton is just off junction 15 of the M1, and close to the A45. Following a GBP 2 million refurbishment programme, the Northampton Marriott Hotel offers a range of modern facilities in its guest rooms, conference rooms, and the restaurant, bar and lobby. After meetings you can unwind in the Leisure Club, complete with a spa, well-equipped fitness centre and indoor pool. Brasserie Centrale offers a modern interpretation of a classic French Brasserie and offers regional French food with a British influence. Chat's Cafe Bar is a place to relax alone or with friends, sipping a cappuccino or enjoying a light meal. To complement its location, Northampton Marriott has extensive conference and training facilities, including a 220-seat conference suite, contemporary boardrooms and a dedicated business centre. This recently refurbished hotel boasts 32 generously sized rooms fitted as standard with King sized beds. The hotel also has its own Asian themed restaurant offering the best in authentic Indian cuisine. This recently refurbished hotel boasts 32 generously sized rooms fitted as standard with king sized beds and a pull out sofa bed suitable for children under the age of 12. There is also a room designed for wheelchair access on the ground floor. All rooms have recently been fitted with thermostatic controlled power showers and include a hospitality tray and complimentary broadband internet access to the hotels wi-fi network. The Travel Plaza is also able to offer a purpose built meeting room for up to 16 people on a daily basis. Car parking is both ample and free, and is monitored by CCTV security cameras. Breakfast is not included in our room charges, but is available every morning in our adjacent restaurant. The hotel is situated in a quiet spot on the old A6 between the historic market towns of Market Harborough and Rothwell on the Leicestershire & Northamptonshire border, near the small town of Desborough. The Oak Tree has en suite rooms, good home-cooked food and links to the A14, M1 and M6. It is within easy reach of Rockingham Speedway. The Grade II listed building is walking distance of local amenities. Desborough has a leisure centre, shops and a small weekly market. Each room at The Oak Tree has an en suite bath or shower, a colour TV and tea/coffee facilities. Breakfast and evening meals are available at an additional cost.